Stinger Distribution Blocks allow you to easily run power to your amplifiers. With a wide range of styles and gauges we have a stinger distribution block that will work with your system. 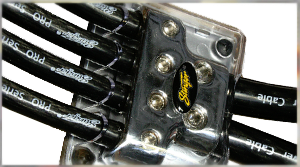 All stinger blocks come with a cover to protect your connections, and the distribution blocks come in gold or platinum. Stinger distribution blocks also have a corrosion resistant finish that will keep your connections pristine for the lifetime of your system.